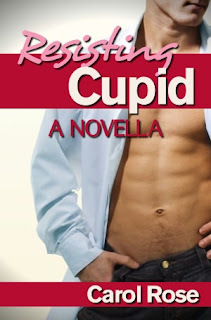 Emma reluctantly returns to Cupid, Texas, stealing time from her career as a television journalist, to be her high school best friend's maid of honor. The four months of her brief, youthful marriage to Tucker, her high school boyfriend, had been fiery in lots of ways. She can't quite forget his kisses, even though she's tried. To her chagrin, she sees Tucker at the wedding rehearsal since his brother is the groom. Just as hot as he was before, Tucker's still the hunky guy she married right out of high school, but now he's a medical doctor. Emma's shocked to discover they're still married. She'd thought Tucker took care of the matter, but he tells her he never got a divorce. They're still married and Tucker isn't sure he wants a divorce. He still has feelings for Emma. She has to decide if the flames between her and her husband deserve another shot. RESISTING CUPID didn't do it for me, unfortunately. It wasn't that it was badly written or anything, it was just very bland. I couldn't sympathize with the characters because they weren't really fleshed out. I didn't know them or get what their problem(s) were, so I just didn't care about them or their happiness. I also struggled understanding what the big deal from their past was that was so bad that it caused them to separate in the first place. This isn't the same cover as the one I have on my copy, but I much prefer this lighter one. Still cheesy looking but at least it isn't dark like my copy.